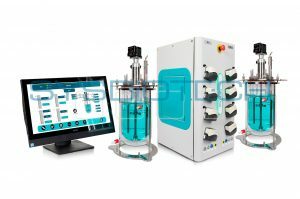 This equipment was designed for process development and scaling-up the cultivation of microorganisms for biofuel enzyme production. 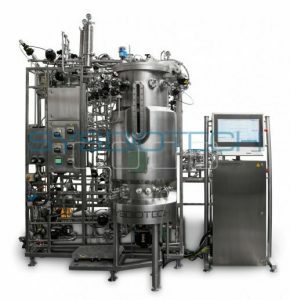 Vessel for sterile media preparation. SIP (sterilization-in-place) sequence is fully automatic. You can set your own sequence parameters for achieving the best results. 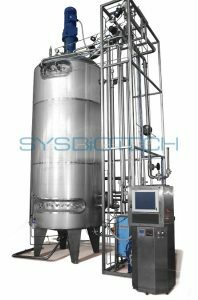 All wetted surfaces of fermenters are made of AISI 316L stainless steel with surface finish of Ra 0.8 μm which allows for effective CIP (cleaning-in-place) process. 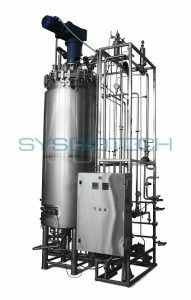 Production fermenters are connected with seed fermenter 500L via seed valves. 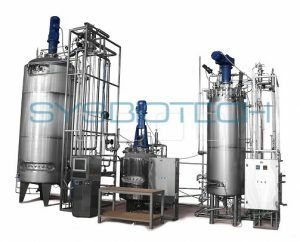 This assures fully aseptic conditions of inoculation. 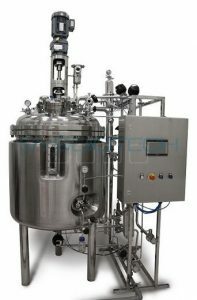 The connections between fermenters and feeding vessel are also sterile. 7.5 Sterilization temperature at 121°C during 60 min. Vessel and double jacket temperature: Measurement, control and recording. Sterilization control via existing solenoid valves. pH: Measurement control and recording. Control via acid and base pumps. Dissolved oxygen: Measurement, control, and recording. Control via cascade with agitation speed or MFC Air. Air and O2 rate control via mass flow meter (if needed). Agitation speed measurement control and recording utilizing frequency inverter. Anti-Foam: Measurement control and recording. Control via foam pump. Level: Measurement control and recording. 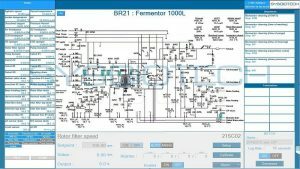 Universal control system for fermenters of any volume. 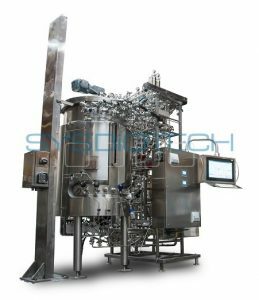 To minimize the number of errors, different fermenter operators have four different levels of access to the control system.